William Frick & Company, an Illinois-based labeling company which also manufacturers and distributes RFID tags, has announced a partnership with South Carolina’s Technologies ROI (TROI). 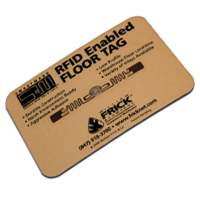 Under the deal, Frick will be the exclusive North American distributor of TROI’s line of harsh environment RFID tags and labels. Frick will market the TROI tags as part its SmartMark line. Among the conditions the various tags are designed to endure are extreme temperatures, repeated hard blows and curing in concrete. In business since 1975, William Frick & Company has expanded its durable custom labeling business to include RFID tags and solutions for a variety of applications. TROI was founded in 2002 and has a strategic focus on designing RFID tags for challenging environments.